“I’m just so pleased with my new orangery, it’s made such a difference to how we use the house now. From your first visit through to completion the whole process was completely hassle free. The level of workmanship was excellent, all the team at Castle were so friendly, polite and professional. I’ve absolutely no hesitation in recommending them”. Castle design and install a wide range of market-leading orangeries and conservatories featuring such products as lantern roofing systems. This style of roof continues to be a popular choice for our customers in Surrey, South London and Sussex who want to build an open plan kitchen extension – not just because of its stylish aesthetic, but its outstanding performance too. A roof lantern is ideal for homeowners who want to extend their property and benefit from a room which that is both private and well lit. 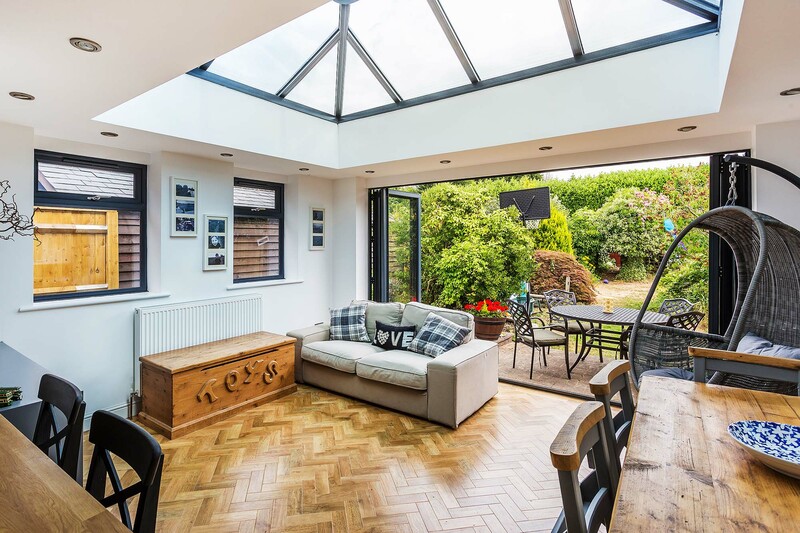 If you’re thinking of creating more space in your home – and are trying to choose between an orangery or conservatory – contact our team today for information and a no obligation quote. At Castle Conservatories we pride ourselves on our customer service and the many satisfied clients that we have and we are always delighted when our customers are happy to share the experience they have working with our team on their dream room that we have designed and installed for them. 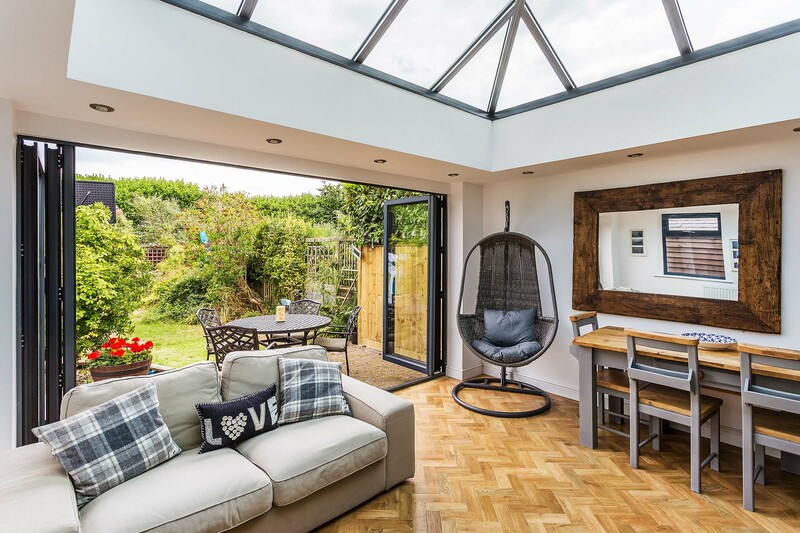 Here we look at the stunning open plan kitchen extension with a roof lantern that we designed and built for Miss Sanders in 2017. We were commissioned to build an orangery that would connect her home to her garden whilst extending the internal footprint of the property and so that she could enjoy the fantastic views of the garden all year round. She wanted her new room to exhibit a modern feel, internally and externally, resulting in clean and eye-catching sightlines. We were asked to design an orangery which looked comfortable and acted as a natural extension of her home. 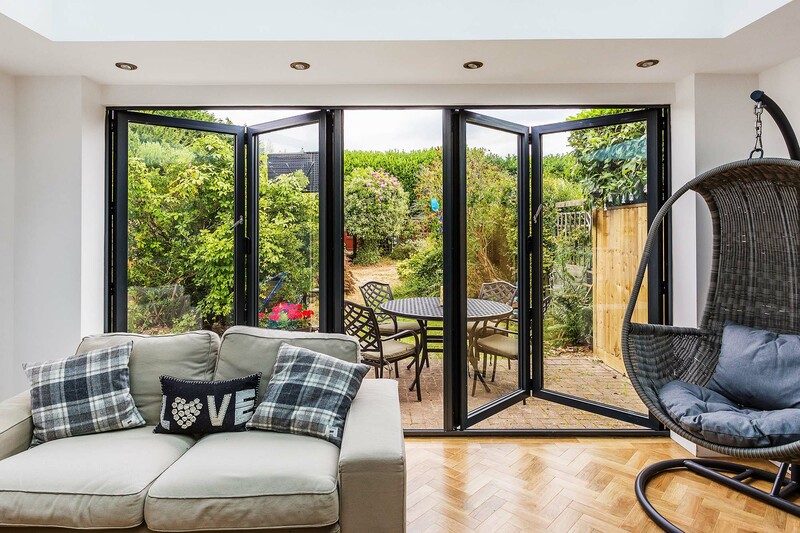 The bi-fold doors installed work in tandem with the roof lantern to create wide panoramas of the garden ensuring that as much light as possible enters the rear of the home, ideal for both enjoying the warmer months or for enjoying the garden view during the winter from the warmth of the new room. 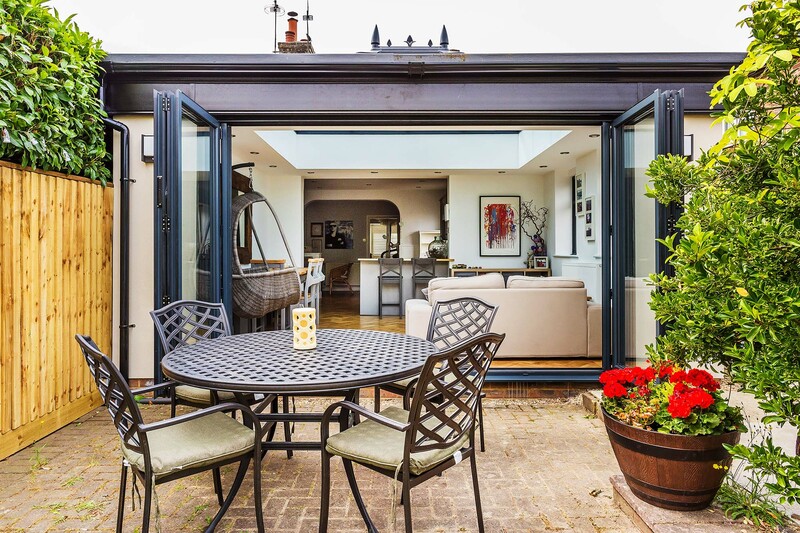 Fantastic threshold access played a pivotal part in the design of this kitchen extension with a roof lantern allowing fluid navigation between the three spaces, kitchen, lounge area and garden. The lantern roof style excels when it comes to letting as much light as possible into a room. The modern design features fewer bars than a traditional roof and therefore able to provide better illumination than other roof products currently available on the market. 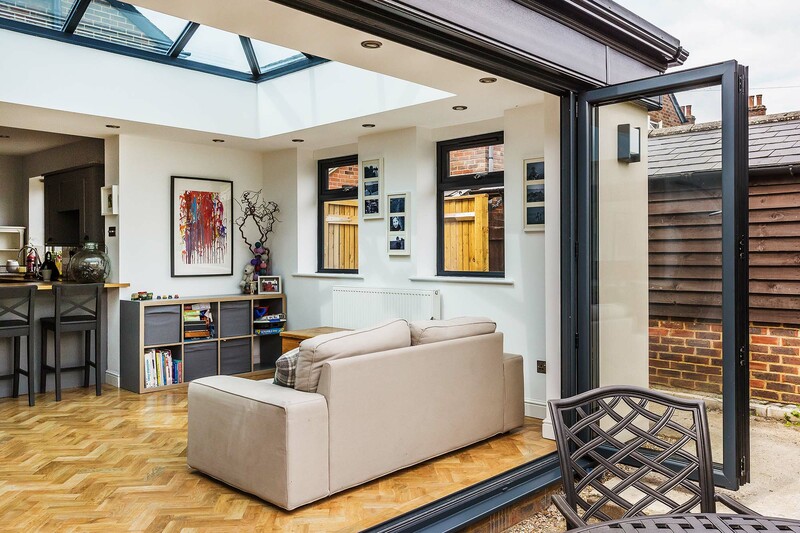 In this particular case, the lantern roof works seamlessly with the wide-spanning swing outwards to create a room space that is all about openness. 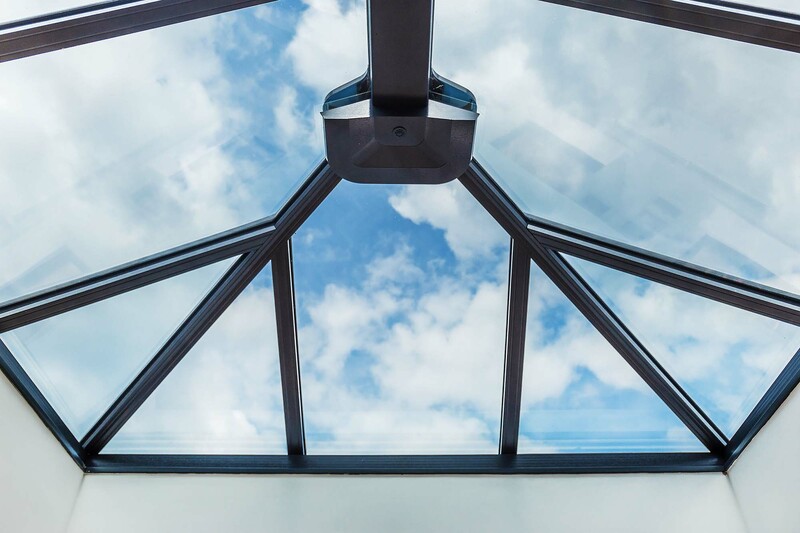 The newly-installed roof lantern is of the highest quality and specification. It is also thermally efficient allowing you to enjoy a U-value of 1.1 – making the room comfortable and lowering their energy costs. 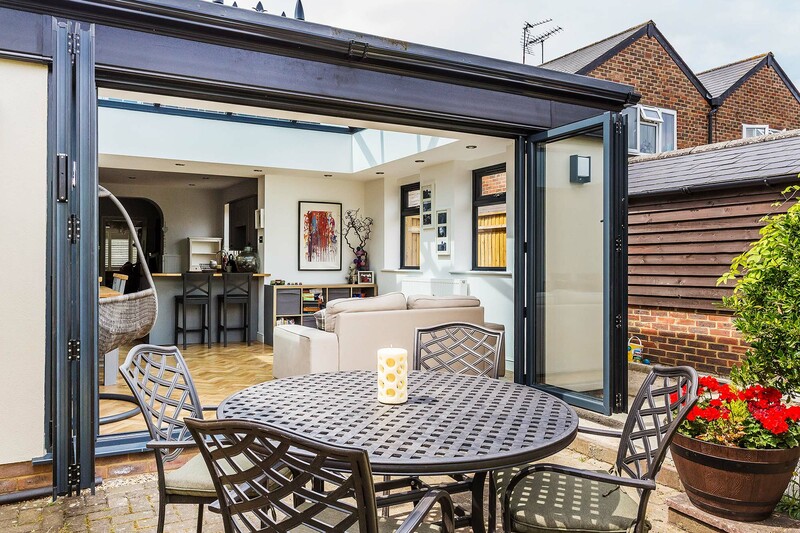 The clean modern exterior of this stunning modern kitchen extension gives outstanding sightlines that add genuine market appeal to the overall design. 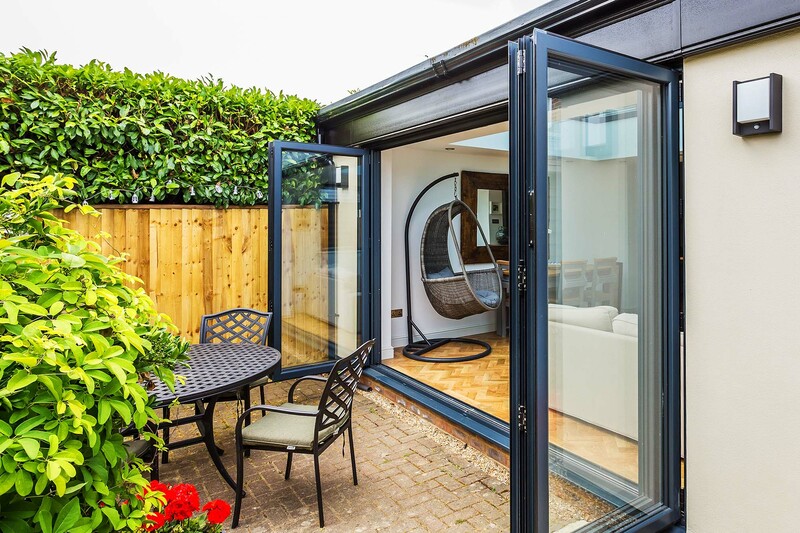 The darker tones used to match the roof line, lantern roof and bi-fold doors result in a contemporary appearance that contrasts with the internal décor. The overall effect achieved is stunning. Miss Sanders is able to enjoy the cosy ‘room like’ feel that this roofing system gives. The roof design allows speakers and spotlights to be added internally in the unique perimeter boarder adding to the evening ambience of the room, the end result is a space that feels connected to the outside but also a unique place to entertain and relax in in their stylish modern room. 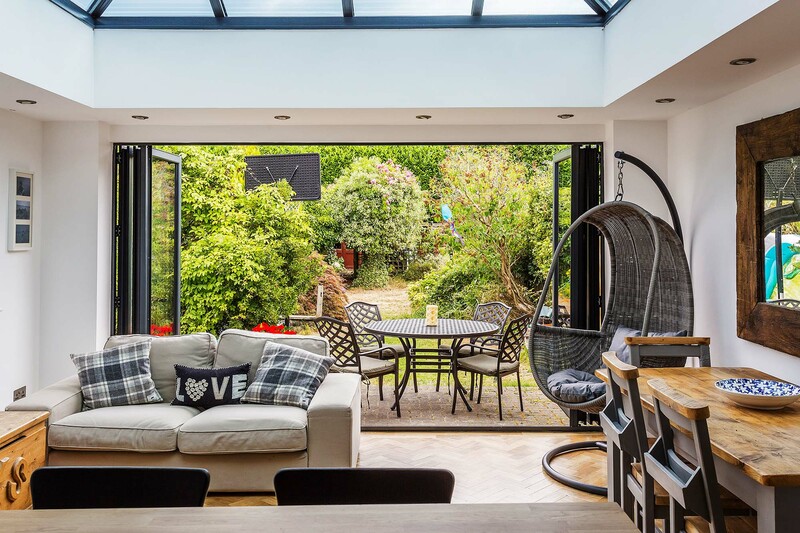 Whether you’re planning a modern house extension, orangery or conservatory, the Castle Conservatories team has the expertise to make your home expansion project a success. Our designs will be tailored to suit the size, shape, age and style of your property. The finished room will look and perform exactly as you had expected it to. Take our Virtual Reality Tour to learn more about the products you’re interested in, then contact us for further information or to book a no-obligation appointment.